Via their The National Command & Control Center (CCC) weekly MERS Monitor publication, the Saudi MOH has provided us with our most complete look at the recent Buraidah MERS cluster to date. In addition to discussing apparent lapses in hospital infection control procedures and delayed diagnoses that have exacerbated this outbreak, they also discuss the possibility that asymptomatic `healthy looking' people may be transmitting the MERS virus, particularly to immuno-compromised patients when they visit. Asymptomatic transmission of MERS is something we've discussed often (most recently in Saudi MOH: 2 Asymptomatic HCWs In Buraidah Outbreak), but it remains an unproven theory. It would, however, explain at least some of the large number of community acquired cases with no known risk exposure. Although these weekly reports only began late last October, they have provided far more detail than we've seen previously out of Saudi Arabia's Ministry of Health, and are a welcome addition to their reporting. MERS had caused multiple large Health-care Associated Infections (HAIs) and outbreaks. 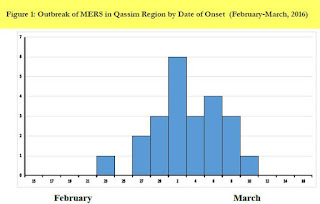 Within about three weeks (22 Feb - 12 Mar 2016), 23 cases of MERS were reported from Qassim Region, predominantly from one hospital (Figure 1). The cases included 5 primary cases, 12 secondary cases and 6 healthcare workers (HCWs). The recent outbreak of MERS in Qassim and occurrence of 18 HAIs, including 6 healthcare workers (HCWs) is an event that raised many issues for reconsideration. Only 4 secondary cases of MERS have been reported from different Ministry of Health (MoH) hospitals since the beginning of 2016. Occurrence of such a relatively large number of secondary cases within one hospital is disturbing. Preliminary results of an ongoing outbreak investigation indicated that diagnosis of MERS was confirmed rather late; especially for the first few cases of the disease. Some Emergency Room (ER) physicians considered MERS in their differential diagnoses. The overall implementation of Infection Prevention and Control (IPC) within the hospital was probably insufficient. The concept of visual triaging is very simple but MoH health facilities in Qassim could not implement it properly. This could be due to the difficulties in readjusting the designs of the entrances of the hospitals. The adherence of HCWs to IPC, particularly at the ER should be maintained at all times. ER doctors throughout the kingdom need to be reminded continuously about the case-definitions of MERS. Resuscitation, intubation and suction of MERS patient as well as other aerosol generating procedures should not be done by HCWs with no Personal Protective Equipment (PPE) at the ER. Likewise, this procedure should not be done in presence of immuno-compromised patients, or in rooms with no negative pressure or a HEPA filter. In addition, the flow of health visitors; especially for immune-compromised patients, needs to be regulated. It has been hypothesized that apparently healthy visitors could transmit MERS-CoV infection to hospitalized patients; especially if they were not wearing masks, had asymptomatic MERS infection, lean to greet the patient or /and shed some droplets of saliva on the patients following religious prayers or recitation of verses of Quran.